Buddha statues are considered lucky as it is believed to assist the chi energy move throughout the house. 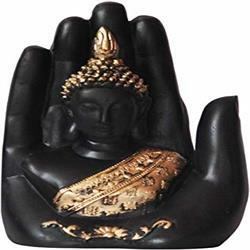 Crafts brings to you this sophisticated Buddha show piece placed on a hand figurine which looks attractive with the minute details done with contrasting colors. Keep it at home, or gift it to your relative to make their lives better.